–Ruth Reichl author of Delicious! –Michael Ruhlman, author of Charcuterie and Salumi. 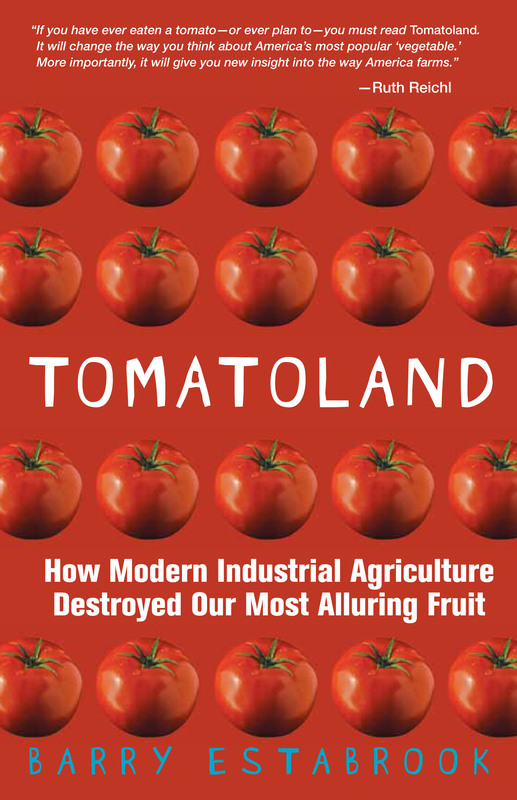 In the 2011 bestseller Tomatoland, Estabrook took on industrial agriculture, faulting it for destroying the crops we eat. In this fascinating volume, Estabrook turns his attention to hog farming and the natural history of the pig. 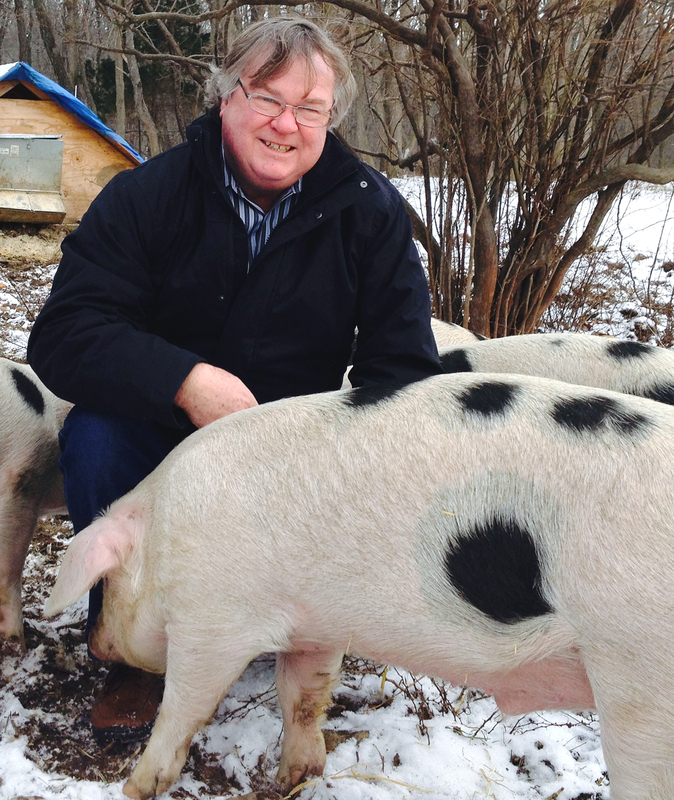 Although he lives on 30 acres in Vermont and has some pig farming experience, Estabrook eschews the common “going back to the farm” storyline in favor of an investigative journalism tack. In elegant prose, he highlights various topics such as porcine intelligence, the pig’s ability to destroy a landscape, hunting wild hogs, industrial hog farming, conditions in livestock processing plants, and sustainable “retro hog raising.” Some of his points aren’t groundbreaking–he scorns factory farms that poison the pigs and the land, while praising local farmers who respect their pigs and their customers’we11-being and offer tasty and healthier pork-but he has an admirable ability to clearly portray each person with a connection to hog farming, swine research, or animal rights, creating a personal connections that go beyond facts and figures. An eye-opening investigation of the commercial pork industry and an inspiring alternative to the way pigs are raised and consumed in America. 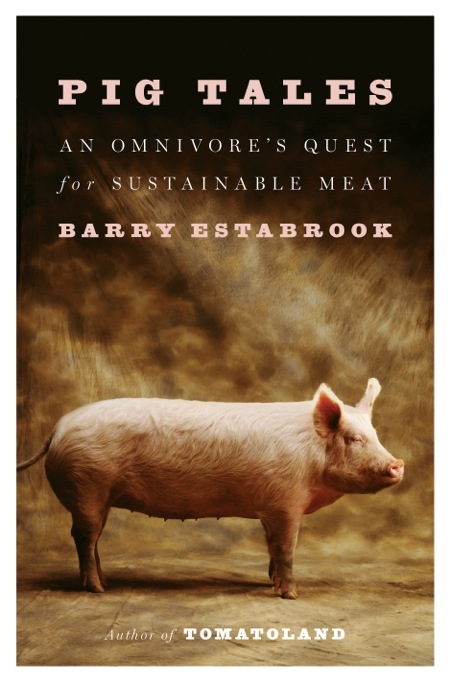 Barry Estabrook, author of the New York Times bestseller Tomatoland and a writer of “great skill and compassion” (Eric Schlosser), now explores the dark side of the American pork industry. Drawing on his personal experiences raising pigs as well as his keen investigative reporting, Estabrook shows how these immensely intelligent creatures are too often subjected to lives of suffering, sustained on a drug-laced diet just long enough to reach slaughter weight, then killed on mechanized disassembly lines. It doesn’t have to be this way, and Pig Tales presents a lively portrait of those farmers who are taking an alternative approach, proving that it is possible to raise pigs responsibly and respectfully in a way that is good for producers, consumers, and some of the top chefs in America. Provocative and richly informed, Pig Tales is bound to generate conversation at dinner tables across America. Perhaps this will turn the pork-obsessed chefs and foodies heads around.There is always hope. We raise Large Black Heritage Pigs in Carbondale Co. We raise them on pasture with organic grain and organic fruits and vegatables from the local grocery stores that would have dumped the in a land fill. This book and the following comments are so spot on. I was V.P. of advertising in my former life and saw tricks that the manufacturers used to con the public. I had the pork council as a client and was there when General Mills invented “Fruit Loops”. My wife and I enjoy bacon and other pork products. After listening to the NPR interview with Estabrook, we decided to boycott mainstream “supermarket” pork and have discovered a local farmer who humanely and organically produces farm raised meat products. We are able to visit the farm and see with our own eyes the conditions under which the food we will eat are raised. Yes, it costs more, but what price is paid for the inhumane, unnatural, chemically sustained and downright evil production of “Big Pork” that lines our supermarket shelves? The descriptions of the “Big Pork” production facilities provided by Estabrook are viscerally painful and heartbreaking, and should be broadcast on 60 Minutes to a larger audience. How could we have ever come to this? There is no such thing as “humane” meat. While it’s great that some farmers and organizations may now be treating animals better before they kill them so they can have “calmer” animals and “better tasting meat” (for the convenience and profit of the farmer/corporation), the issue of the suffering of the animals as they are slaughtered is not even discussed. There is no such thing as humane slaughter. And for anyone who has any any compassion whatsoever for animals, eating any meat is off the table. Thank you so much for your interview on NPR and for your book. Farm animals don’t have protection by law because people want cheap meat, but the overuse of antibiotics in our meat and environment as a whole is so bad for all of us. And really, is the meat of an animal that has been depressed and scared its whole life, good for us? To treat any animal so inhumanely and as an object for our gratification is beyond disgusting and horrible. We ought to be better than that. All animals – people and others – need fresh air, to be able to run around, to touch each other, to have decent food, and to not be terrified throughout our lives. If we choose to eat meat, the animal at least deserves to have led a decent life.